From the lesson before the Arava Convention, Writings of Baal HaSulam, Igrot, “Letter 17″: …there is he who walks, who is worse than he who sits idly. It is he who deflects from the road, for the path of truth is a very thin line that one walks until one comes to the King’s palace. But how is it possible not to err? Of course we will err! Imagine that we are playing a game where you have to shoot and hit a target, like from an electronic rifle or on a computer. But this game is arranged so that you cannot manage to aim, and the sight is always veering off the target, as if deliberately. You place it on the target, but it suddenly jumps to the side. You place it there again, and it runs away again. This is, essentially, our nature. There is no doubt that I cannot aim precisely at the center of bestowal. After all, in reality, there, at the center of the target, is where the Creator is, the quality of bestowal, love for the neighbor, which is 100% opposite to me. I am unable to go towards it directly, without adding some kind of error, at least a small deviation. And it’s never aiming straight at the target. Even when I am already rising up the spiritual levels, I am able to achieve the intention of bestowal only in a small part of desires, like in a “very thin line.” And the rest of the “circle” is my huge “stony heart” (Lev HaEven), which I am unable to correct for the sake of bestowal. At every level there are desires that I can correct for the sake of bestowal and advance with them, while being unable to do so with all the other ones. So how can I advance precisely towards the goal? After all, what is required of me is something that I am definitely unable to do! That is when we are rescued by the notion of the group. Every one of us, with his “sight,” meaning from the very depth of the heart (from the Light of Hochma dressed into the Light of Hassadim, by virtue of which “the heart understands”) aims at the goal. And no single person hits it precisely, because each one has some kind of error, a deviation in some direction from the central point. But if everyone unites together, each one with his error, then we mutually correct the errors of others. That is how it is arranged. And then we aim precisely at the very center. By virtue of our efforts to unite together, even if they are not sincere, it’s as if we step over the breaking. When we examine nature and human behavior given the egoistic desire to rule over others, we see that the only way to influence it is through the society. It is a fact that once a person provides for his corporeal needs, he wants to rule over others, use them for his own benefit, and make them suit him. And this is why he depends on the society. For this reason if we were to give him an environment that demanded a good attitude from him to be accepted in it, whether he likes it or not, he will have to change his qualities, like jealousy and passion for pleasure and respect, according to the demands of the society. It is his egoistic inclination that demands this connection with a society, a connection where he is the ruler. But the society, can give him an opposite understanding without breaking this connection: Go ahead be great, be proud, be above others! But do it through good, not evil! In other words, the desire, which he used to use in a way that harmed the society and benefitted him, gradually begins to change through his dependence on the society. There are many examples like this in life. For example, a person is running for an election. What does he want? To rule, prove his abilities! He wants to make new laws, establish a new order, and head the government. And what does he say? Something completely opposite: I will serve everyone, work for the common good, I will treat you the best I can, and love you like a father. It follows that a person’s connection with a society forces him to have an altruistic attitude towards it, even if it is nothing but words, even when his actual intentions are completely egoistic. For this reason, if we give a person a proper society to educate him, the problems will disappear. When a person, egoistically running for president, promises the people to carry out all their demands: create jobs, provide shelter, safety, etc., the society must treat him the same way. You want respect? Work for us, do good for us, and you will be valued. Then you will have what you deserve according to the good deeds you do for us. It turns out that we do not complain, do not blame, and do not require a person to change; these demands are meaningless and unreasonable. But we can influence a person in an indirect manner, through the environment, so he would easily accept everything necessary. A person will grow like in a greenhouse, acquiring a form that corresponds to the heat, moisture, atmospheric pressure, and other external conditions. He will enjoy doing it as a game, just like children grow and become wiser by playing. There is no point discussing the way each one of us needs to change since everything depends on the influence of the environment. We simply need to act like in a play. It will be a game—a life-changing game, but still a game, which is so much fun that we will dedicate our free time, freed by our ego from daily obligations, to forming a good environment. We will grow without effort and will easily change with the support of teachers and educators just like children who grow and are changed by playing. We only need to know how to use our free time and knowledge, which we are now receiving, to change the right way. But why haven’t we done it earlier? What prevented us from doing this a thousand years ago, when we were living in an underdeveloped society in past generations? Then we were not able to know and recognize our evil. We thought that the ego helped us develop and didn’t feel that it was bad. The ego pushed us toward progress and development, and we did not consider it to be evil. Well, we became distant from each other, created separate families, marked social and state borders: All these were good things. We never thought that this would bring us to such a big common destruction. Only recently did we start to realize how hopeless our state is, and that the only way to form a new person is by building a new society. Like an incubator, greenhouse, or the hands of a maestro, this society prepares new people out of us who use all the strength they have on top of the animal level for the good, and not evil—and they will become good people instead of evil people. We will try to use the power in the group, society, and humanity in a good way so that when every person connects with others, he would feel that he is close to them both in his heart and soul, in one thought like in one body. He will feel so close to them that he will feel and understand thoughts and feelings that fill the world. Every one of us will include the entire humanity within himself, and then we will see nature has brought us to this wonderful state through our development where every person feels that he is a collection of everyone. This way a person goes beyond the boundaries of the perception of his brief and insignificant life and begins to feel our integral world through the entire humanity. This way we realize the main force of our life, egoism, which distinguishes us and lifts us above the animal level. It actually lifts us, and does not lower us to an unhappy, miserable life where I would feel afraid and powerless, which is worse than the animal level, in fact sometimes when I watch my dog or cat, I envy their lives. Question: What is the problem with learning Kabbalah in our time? Answer: When a person comes to Kabbalah, becomes interested in it, it seems to him that it speaks about things that are outside of him; he feels like the material that he studies is somewhere above, far from him, outside of him, disconnected from this world, outside of this world. Even though he learns about the need for the group, he does not seem to hear that attainment happens in the unity of students. But then, it is explained with more perseverance how to use his knowledge to practically attain the spiritual world, perceive it, enter it – and to do this, he needs to work on the connection between himself and his fellow students. But if a person stays in the group, sooner or later he experiences a breakthrough in his realization of the need for connection with his friends on the journey, to reveal the upper World in this connection. And then, as he unites with his friends, he needs to start uniting with all of humanity. And he is not able to accept this. 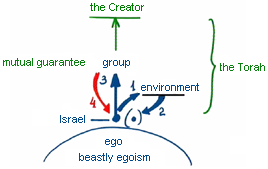 All of his egoism pushes him away from connecting with people who do not study Kabbalah. He does not understand how the upper World might be connected with these folks. At this stage many leave or become delayed in their spiritual development even though they continue studying; they do not advance because they do not realize their connection with others; they only gather theoretical knowledge. So, the first complication is switching from yourself to the connection with the group, the 1%. We gradually begin to comprehend that spirituality is revealed between us, in the correction of our breaking. Today I see the difficulty in switching from working in the group to working with humanity in many groups of ours. But these are growing pains, and they are necessary for the realization of the structure of the upper world. The more the goal of attaining bestowal unto the Creator is important to us, so should the work of creating the collective vessel and attaining bestowal unto friends be important. Thus, we will have to turn to the Creator in prayer (MAN), in order for Him to give us the force of bestowal, the will to bestow, the ability to connect amongst us and attain bestowal. In a group, a person learns how friends should be treated, how to bond with them. When he “buys” friends for himself, he raises a prayer for them, receives strength from them, assistance. We need to attain cohesion with the Creator, as His partners, in equality and mutual love; one needs to attain that state with the friends in order to reveal what it is. Surely, the will to receive and our initial nature despise this business. Yet, we will have to engage in it because other than that, there is no meaning to our reality, our life. For that purpose, we are born and exist on the beastly level, in the meantime, in order to reach correction. Hence, it turns out that the friends are no less important than the Creator. And creating the collective vessel is equal to attaining the goal of Creation, attaining the love and cohesion. We need to realize the immense power found within the group, and that is the only means to attain the goal of Creation, meaning, the attribute of bestowal. That is what our inner, personal work in the group is devoted to, and similarly, the external work relating to the entire world. The whole world is also suffering. The question of “What is the purpose of my life?” leads each one of us to a group at some stage to study Kabbalah, and to a teacher, obligating us to study. Likewise, the entire world is seeking the meaning to its lost life, and nature is uniting us coercively into a group, an integral, global world. Whether people want it or not, they are beginning to feel they are interdependent. Therefore, there’s not a big difference between what our groups are going through and what the whole world is enduring. Certainly, there is a difference in the pace, conditions and exposing the material; yet, the more we advance forward, we’ll be more similar, simply like twins. Our small group (those hundreds of thousands of friends belonging to it) will grow closer and closer to that large group comprised of seven billion people alive in the world, thus, we’ll reach a closer understanding of the goal. In the News (from Examiner): “According to NASA, as reported by National Geographic, an iceberg the size of New York City is about to break off of Antarctica’s fastest melting glacier. The ice crack measures 350 square miles, which is more than the 303 square miles that covers all five boroughs in the city. … It isn’t known when the iceberg is going to break off, but the educated guess is sometime within the next few months. My Comment: Climatic problems, which are the result of our imbalance with nature, are the most tragic. So far, we underestimate our impact on nature: We believe that we inflict harm by exhaust and garbage, but in fact, our spiritual non-compliance with nature causes the most devastating and direct impact on it. Our egoistic relationships are responsible for major imbalances in nature and are the cause of all crises and climate challenges. Question: What is the basis of the fusion of the three concepts: “Israel, the Light, and the Creator? Answer: The basis is that these concepts are not separated. Everything is One. Reality is simple: the desire to receive filled with light. And the question is only one: How can we discover where we really are? How can we discover this reality? How can we add the knowledge about it to our lives, to our current state? In the end, this is what the wisdom of Kabbalah reveals. Beside this, there is nothing. This reality is permanent. There is no time, place, or distance, but reality simply exists. We can’t imagine this to ourselves without the characteristics of this world, but it exists. Within it we discover both the Kli (vessel or desire) and the Light, meaning all of its components, and thus we reach real existence. We don’t understand how separated we are today from the truth. Israel, the Light, and the Creator seem separated to us. But we need to connect them into One. The person who tries to discover the true reality is called Israel since he yearns “directly to the Creator (Yashar Kel).” Light is the Light that reforms, that brings a person to the goal. The goal is the Creator, the upper force, the root to which we long for. Thus everything is connected at the root, and through this, I return to Him, I really become like Him. From the Constitution of the Arava Convention: During all the days of the convention I commit to disconnect internally and externally from the physical world and to forget about myself. I disconnect myself and am ready to escape from the present state, to jump into the Red Sea, to lose my head, to leave everything, remain naked and destitute, and to accept whatever comes, only because it comes from Above. We should rise above everything that we are. Constant efforts are required here. It says: “They helped every one his friend.” If the whole group aspires towards this ascent, to faith above reason, it will work on everyone, and it will be easy for everyone. Now we find it hard to connect, but if we want to use the power of unity, we will suddenly feel a relief. When the general force operates on a person, the difficulties disappear. He stops fearing, and the current sweeps him away. This is what we must attain. Actually, all the conditions are easy if we carry them out through unification. In the convention everyone is responsible for all. It is mutuality, mutual guarantee. Everyone worries about the others, about unity. Inside me I should constantly pray for the friends so that they will connect, so that their desire will finally come true. If this prayer lives inside me, then undoubtedly I am also inside.